The 6.6L Duramax Diesel LMM engine, nearly identical to the previous generation LBZ, shares its increased piston pin diameter and thicker connecting rod section width over earlier versions. The biggest change of the LBZ motor, which saw service for just two model areas, was the addition of a Diesel Particulate filter (DPF) along with required hardware and software. General Motors reported at the time that the changes that created the LMM cut diesel particulate emissions by up to 90 percent over the LBZ. The 6.6L (403 CID) Duramax LMM is a 90-degree V8 diesel engine produced from 2007 through 2010 and feature aluminum cylinder heads with four valves per cylinder. Unlike other engines in the category instead of utilizing double overhead camshafts in each head, with its related complexity, GM achieved equivalent breathing capabilities with a single camshaft, pushrods, and dual rockers. Compression ratio is a heavy 16.8:1 while the cylinder configuration is oversquare – unusual for a diesel engine, with a bore of 4.055" (103 mm) and a stroke: 3.897" (99 mm) inside the cast iron block. Intake air is compressed by a Garrett variable vane turbocharger (VVT and air-to-air intercooler. Fuel is delivered by a 26,000 psi Bosch high pressure common rail with CP3 injection pump. The Duramax 6.2L LMM engine offered a slight increase in horsepower (+5) and torque (+10) over the LBZ. 2010 was the last model year that the LMM was available, as it was replaced by the more powerful, more efficient LML for the 2011 model year. The LMM develops 365 horsepower at 3,100 rpm and torque of 660 lb-ft at 1,800 rpm. The LML version of the 6.2L engine developed 397 horsepower at 3000 rpm and torque of 765 lb-ft at 1600 rpm, which is an increase of 33 flywheel horsepower over the 2010 LMM configuration. There’s a simple solution to gain back some of that horsepower and torque. 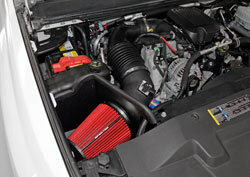 The Spectre 9982 air intake system for 2007 – 2010 Chevrolet Silverado 2500 and 3500, and GMC Sierra 2500 and 3500 6.2L diesel, brings performance increases that can be achieved by a DIY installation that takes under an hour with simple hand tools and no re-calibration of engine electronics required. The way to achieve increased horsepower and torque, particularly with a turbocharged diesel engine, is to deliver more and cooler air. The electronics will feed fuel into the cylinder to match the detected temperature and volume of the intake flow. The greater volume of cooler air that can be fed into the cylinder will result in greater volume of fuel being injected, delivering the sought-after increase in power. 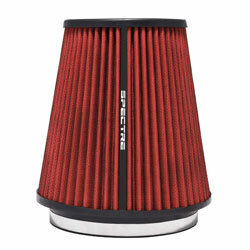 The improvements in incoming air flow begins with the Spectre HPR (High Performance Racing) HPR0891 8.5-inch cone air filter which is designed specifically for the air flow and filtration needs of a diesel engine. The air filter was designed and developed for exceptional air filtration to protect diesel engines while still providing increased air flow over a standard paper air filter. This washable cone filter come factory pre-oiled and ready to install. In addition, the powdercoated heat shield protects the intake flow from under-hood temperatures so only cold, fresh, outside air is directed to the engine intake. 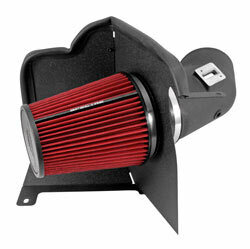 A velocity stack draws air in from the filter and into the textured black cast aluminum air intake tube that’s smoother with fewer bends providing higher air flow capacity that the OEM hose, which connects directly to the Duramax throttle body. The Spectre 9982 air intake system utilizes a non-woven synthetic filter media to help protect your engine from harmful debris. The air intake system comes with the above-mentioned reusable low restriction air filter, high quality tubing and a black powder coated heat shield to help prevent hot engine air from entering the intake inlet. 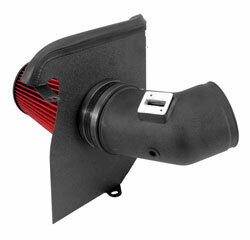 Spectre Air Intake Systems come with the necessary boots, clamps and hardware for an OE fit and finish. The kit also accommodates all factory emissions and vacuum lines. OEM mounting brackets and hardware are utilized to allow for quick and easy installation. No holes to drill! For almost 35 years Spectre has designed and sold unique and innovative parts and components to fuel your car or truck obsession. Our products are designed and tested to perform and last. We have a modern, computer-controlled chassis dynamometer that accurately measures horsepower and torque at the wheels. We also utilize a top of the line SuperFlow SF-1020 flow bench with airflow, pressure, and velocity measuring capabilities in both intake and exhaust modes to help develop our state-of-the-art products.